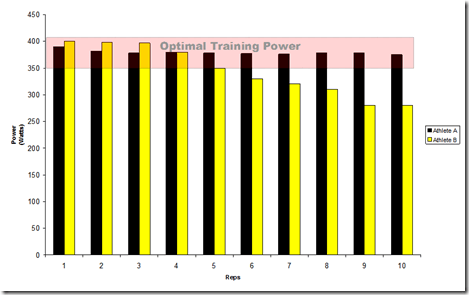 In the last few years I have seen many companies develop linear encoder and accelerometry-based systems to measure power output during weightlifting exercises. This is mostly due to the fact that linear encoders and accelerometers are becoming relatively cheap and it is getting easier to write appropriate software routines to perform all measurements. I have been using for one year the SmartCoach and I am very pleased with what i have seen so far. I have used it mainly for testing purposes and to analyse training sessions and testing sessions performed by strength and conditioning coaches around the country with the remote coaching modality. The software is simple, easy to use and starts with a very good diary/scheduling system which allows the production of nice training schedules which can be sent to athletes and coaches. Remote coaching is a great function as it allows a remote coach to write a session or check the content and execution not only in terms of sets/reps/external load but also in terms of power output per repetition. It really works very well! The software engineers have recently developed new routines to allow the users to perform strength testing and graphically present the Force/Velocity and Power/Velocity relationships to allow the determination of various parameters useful for strength training prescription. I am pleased with this product and I recommend anyone interested in visiting the website to download the software for free! Time goes fast and I just realised how long ago I wrote the first part of this article. So, let’s try to start from where I left. Monitoring training and avoiding mistakes was the topic I left the readers with. Generally speaking, technology in this field is moving very fast and in the very near future I envisage the ability to be able to monitor physiological and behavioural responses to training in team sport in real time, with the ability to make some sensible decisions to optimise training gains in team players. Heart rate monitoring for example has become nowadays accepted standard practice in the team sports World and also in the Football/Soccer environment nowadays many training sessions are monitored to quantify the effort of the players and the characteristics of the drills employed by the coaches. In order to quantify training intensity, due to the intermittent nature of team sports, time spent in various intensity zones is quantified. 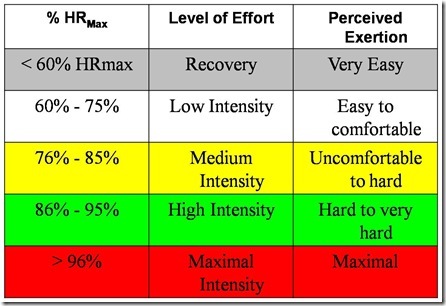 A simple classification is presented and it is based on defining zones with heart rate presented as a % of Heart Rate Max or Heart Rate Reserve. Of course, in order to have a precise determination of such training zones it is important to measure Heart Rate Max rather then using the 220-age estimation. Heart Rate measurements can be used to define not only the overall intensity of the training session, but also the intensity and demands of individual sessions. This approach allows the coach/S&C coach to develop a database of drills which can impose on the players similar demands in order to be able to change sessions and reduce the boredom factor. By using Heart Rate based measures in combination with blood lactate it is in fact possible to compare game-specific drills with more generic drills such as intermittent sprinting and/or repeated sprints and verify the demands on the same player of such activities. 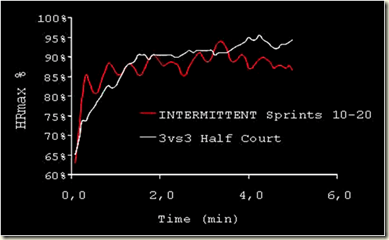 In the following example we can see how intermittent sprint drills (10s activity-20s rest) provided a similar physiological response to 3 vs.3 in Handball players. This suggests that when training time is limited, the use of well planned technical and tactical drills can represent a significant training stimulus. Of course, what is important to remember is the fact that game-like drills can be effective only if we know how demanding they are. The physiological responses to such drills depend in fact on the rules used in the drills, the space, the number of players and the quality of the players involved. Generalising data findings from other sources is not the way to plan training. In order to successfully implement game-like activities in your training programme requires accurate measurement of the physiological demands in your particular group of players. In elite team sports athletes it is also effective to plan specific sessions in which game-like drills are combined with more generic repeated sprint drills. A practical example could be to alternate 10 minutes of a game-like drill with repeated sprint drills (such as shuttle runs etc.). This approach can be very effective and can lead to improvements in aerobic capacity without the need to dedicate too much time to training activities which not involve technical and tactical elements. 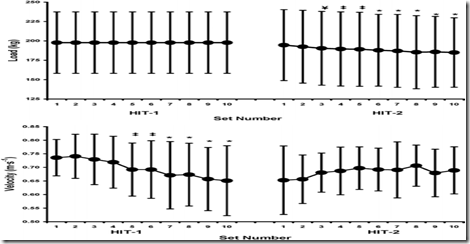 The following data are the yo-yo test distance scores of an elite handball team performing for one month training sessions characterised by game-like activities mixed with intermittent work. This is of course only part of the picture. In team sports we want athletes to be able to perform high-intensity movements for the duration of the game, but we also want them to be fast, strong and powerful. Strength training and monitoring activities aimed at maximising gains in this area of the players’ fitness are very important and will be now discussed. First of all, we have to take into account what kind of variables we are interested in. 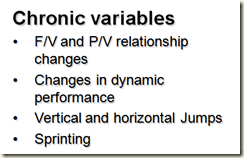 Acute variable can help us in understanding how a session is going and how it is affecting the player. Chronic variables can give us more information on how effective a period of training has been and where is our training programme leading to. 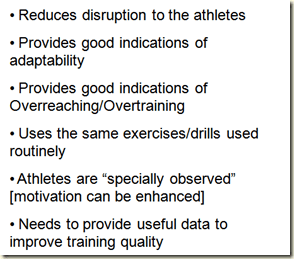 However the last point is the most important one: if your monitoring activity does not provide data which are useful to improve your training prescription you are just collecting data which will not impact on the quality of training! If the aim of the session/programme is to maximise power output, we need the athletes to be able to produce power within 90-100% of their maximum power for the given load. By monitoring how they respond (provided that they are encouraged to perform the concentric phase of the lift as fast as possible), we can improve our training prescription by dividing sets and reps to make sure the target power output is attained for the total volume of reps we want the athlete to perform in our programme. MVC is the maximal voluntary contraction (measured isometrically). The difference in the median frequency of the surface EMG (after rectification and fast fourier transformation of the EMG raw signal) between the two modalities of exercise clearly suggest a difference in motor unit recruitment patterns when performing the two types of loading. 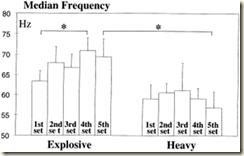 Note that the sets and reps where the same, with a difference in external load and velocity of movement. By measuring in real time such parameters it is possible to change the session while it is being performed (again, if the aim of such session is to improve power and speed). 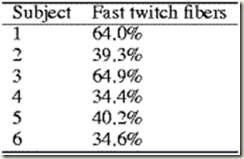 The following example from Lore Chiu and coworkers (2004) shows that if you are monitoring the speed of the barbell/weight stack and you observed a decrease in speed, of course by changing the external load you can make sure the speed of execution is increase and is matching what you planned for. The key message here is that we should still plan sessions with sets x reps x load, but we should be able to measure the output in order to make sure the athlete is performing what we require in order to maximise the adaptations and make sure he/she is not wasting time in the gym! 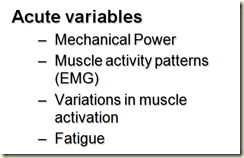 While everyone tends to accept the general adaptation syndrome paradigm, whereby a training stimulus challenges homeostasis and takes a certain amount of time to be recovered. Very few people actually measure what it means and if it is possible to track the various phases of responses to a single training session. The following approach is an example conducted with an Handball team using vertical jumping tests (in this case the Counter Movement Jump [CMJ]) before, during and after a session of plyometrics (approximately 200 jumps in total). You can see that while the team average score seems to be recovered within 24 hours of such session, some individuals have recovered (BP) and some haven’t (SO). Individualisation should be a fundamental approach to team sports! But if you don’t measure anything…how can you individualise? While everyone talks about it, I still see scarce evidence of this actually occurring, where are the data? I have already presented examples of monitoring training load and adaptations in some team sports showing that different approaches of periodisation can be used depending on the level and the performance goals of the team and both approaches can produce improvements in the players when it counts (http://marcocardinale.blogspot.com/2007/12/strength-training-in-volleyball.html) if you know what you are doing. Testing modalities and ways of tracking individual and team progress have also been discussed here before. I will spend few words with regard to hormonal monitoring which is now becoming something everyone claims to be an expert in. I recently came across a lot of manufacturers which claim can sell devices able to measure quickly (almost realtime) salivary concentration of hormones (in particular Testosterone and Cortisol) and/or measure hormones in capillary blood. I regret to inform all readers that to my knowledge there isn’t a single device which provides good reliability and validity of the measures taken, furthermore while measuring such things can be useful, it is still an expensive exercise which requires time and most of all real expertise not only in conducting the necessary assays to measure hormone concentration but also in understanding the validity and the meaning (and most of all the limitations) of the data collected. To real make and impact, hormonal monitoring should be performed routinely, with many data points during the day, and following strict guidelines in terms of sample collection, storage, preparation and analysis. 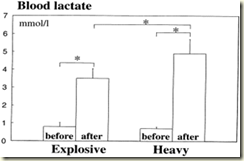 Collecting only baseline morning fasting hormonal measures might not help in explaining the bigger picture. 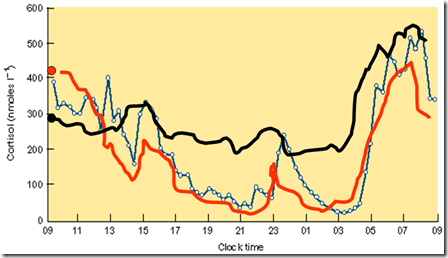 In the example below, Cortisol levels are presented during the course of the day showing a clear circadian pattern. The Blue line represents “normal” patterns of cortisol secretion. The red and the black line represents alterations I have observed in some athletes following specific training periods. The red and black dots represent the single point, morning fasting sample. 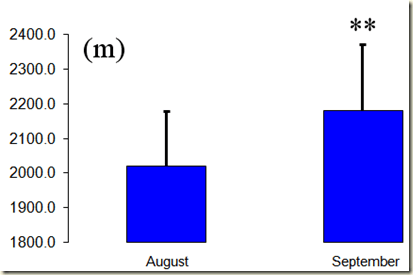 As you can see, having only 1 data point might mislead you….as clearly while the subject represented by the black line would appear to have lower cortisol values in the baseline sample, his cortisol pattern is different from normal and his cortisol values are actually overall higher during day and night suggesting some indications of overreaching/overtraining. There is a clear message here. Beware of the so called experts…hormonal monitoring is an interesting field, but still no conclusive evidence on how it actually work, most of all, very few people understand it but many are out there selling all sorts of services and “expertise”. The use of testosterone and cortisol as biomarkers to understand training adaptations is an interesting field but requires the appropriate knowledge of physiology, techniques and limitations in order to be used to make the “right calls” when it comes to training prescription. In the last few weeks I have been working with my colleagues Blair Crewther, Christian Cook, Robert Weatherby and Paul Lowe on an extensive literature review addressing the evidence and implications of the short term effects of testosterone and cortisol on training adaptations and performance. I will keep the readers up to date when such paper is published (hopefully soon). If a treatment shows an improvement with P<.01 it means that there is a probability of 99% of the treatment being effective. If you are terminally ill, would you take a pill that gives you 80% chances of surviving (P<.20)? In athletics terms…if a training programme can give you 80% chances of a 2% improvement which could win you a gold medal…would you use it…or would you wait for P<0.05? >I have been enjoying the podcasts produced by Dr. Jose Antonio and Dr. William Kraemer in the last few months. The podcasts are well packaged and provide the opportunity to hear various experts discuss strength and conditioning techniques, research and nutritional advice. The format is simple and easy to follow and can be a good addition to your IPOD library.